Union County, NJ – A favorite Union County tradition returns this year with the annual Holiday Sound and Light Show hosted by The Model Railroad Club. The centerpiece of this festive extravaganza is the club’s sprawling, meticulously detailed HO scale layout at the A. Paul Mallery Model Railroad Center, located in a mixed-use area of Union County’s Lenape Park off Route 22 East in Union Township. This year, the Holiday Sound and Light show begins on Friday, November 23rd from 12:00 p.m. to 8:00 p.m. Shows will continue from 7:00 p.m. to 10:00 p.m. on Fridays, from 10:00 a.m. to 8:00 p.m. on Saturdays, and from 11:00 a.m. to 6:00 p.m. on Sundays until December 9. The last show of each evening starts approximately 30 minutes before closing. “The show is designed to capture the imagination with a ‘you are there’ feel, and the layout itself is a decades-long labor of love at the heart of our mission,” said Railroad Club President Tim McCollum. Attendees can stay as long as they like to enjoy more than one show, view an elaborate N-scale layout and other displays at the Railroad Center, purchase refreshments at the snack bar, and stock up on train-themed holiday gifts at the gift shoppe. For the convenience of attendees with babies and small children, a play and rest area is also located on the site. 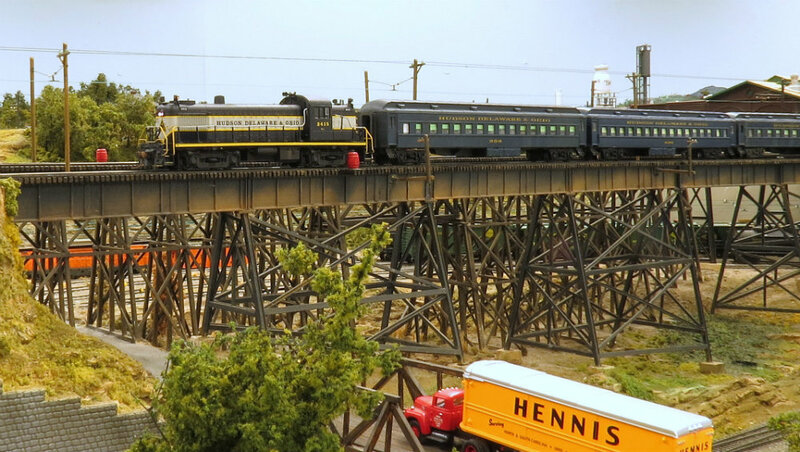 The Model Railroad Club is dedicated to preserving and sharing the art of model railroads while providing the public with a fascinating window on the history of the New Jersey-Pennsylvania rail corridor. The Railroad Center is open to the public every Saturday during the year. Each fall for the holiday shows, the layout is transformed into a living theatre complete with sound and lighting effects and professional narration. Tickets are available both online and in person. Visit themodelrailroadclub.org/advance-show-tickets online to order advance tickets at the discounted rate of $9.00 for youths and adults age 12 to 59, $7.00 for seniors age 60 and up, and $4.00 for children age 3-11. Children under age 3 are free. Online sales continue from now until the series ends on December 9, but the online discount rate is only available until November 18. After that, prices increase by $1.00 for each age group. Attendees can also purchase tickets in person, by visiting the ticket window at the Railroad Center. The Railroad Center ticket window is open during regular Saturday public hours between 1:00 p.m. and 4:00 p.m. on November 3, 10, and 17. It is also open during the scheduled hours of the Sound and Light Show beginning at 12:00 p.m. on Friday, November 23 and ending on December 9. For tickets bought in person on the day of attendance, the regular rate applies. Tickets bought in person for a future date are offered at the discounted rate. The Model Railroad Club, Inc. is a non-profit organization that built and runs the Railroad Center through an arrangement with the Union County Department of Parks and Recreation. Work on the HO display began 40 years ago with the construction of the Railroad Center in Lenape Park, and it has been enhanced and expanded since then. Work on a major expansion is under way, practically doubling the size of the original exhibit. The Model Railroad Club has been a part of Union County since its founding in 1949 by Master Model Railroader Paul Mallery. 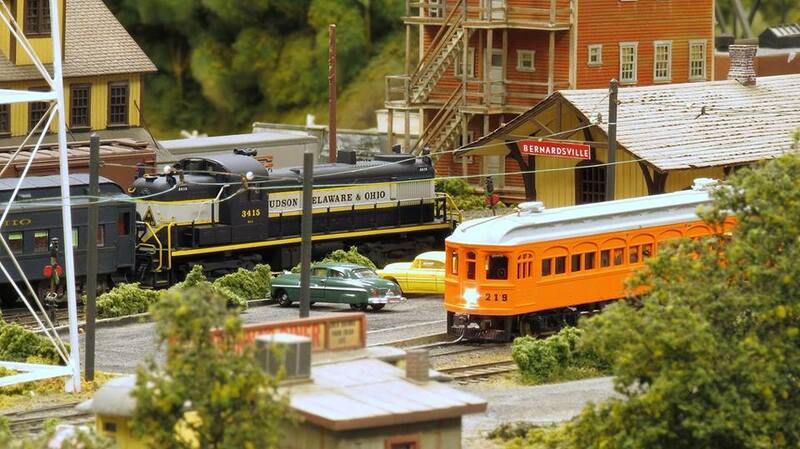 Today, it is one of the largest model railroad clubs in the region. New members are always welcome to join the Model Railroad Club. Current members are on site during visiting hours and are happy to provide information about Club activities. Prospective members can also request information on joining by email, at info@tmrci.org. All proceeds from the Holiday Sound and Light Show go towards funding the Railroad Club’s activities. Directions: The A. Paul Mallery Center is conveniently situated in a mixed-use area of Union County’s Lenape Park, off Route 22 East in Union Township, behind the Home Depot at 930 South Springfield Road. Enter the Home Depot parking lot from Route 22 East or from South Springfield Road, and go to the far (west) end where the Home Depot garden center is located. Follow a small sign to find the service road behind the garden center. The Mallery Center is at the end of the road. Photo credits: All photos courtesy of The Model Railroad Club, Inc.